ARC Race 2013 will see the maximum number of yachts participating some 245. 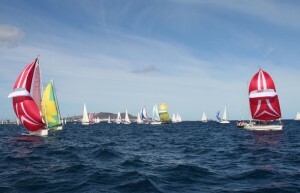 So much was the demand for the ARC Race 2013, all places were filled by January, that the World Cruising Club decided to organise another race called ARC+ .This rally will leave Gran Canaria on 1oth November (two weeks earlier than the official ARC Race). 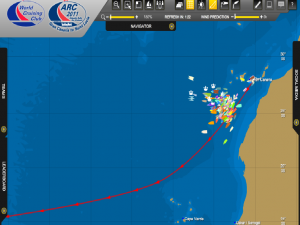 ARC+ has a stopover in the Cape Verde Islands before heading across the Atlantic to the finish in Rodney Bay, St Lucia. The ARC Race is one of the largest trans-Atlantic rallies in the world. The first race was held in 1986 and has proved to be very popular with sailing enthusiasts ever since. It features on many a sailor’s bucket list. 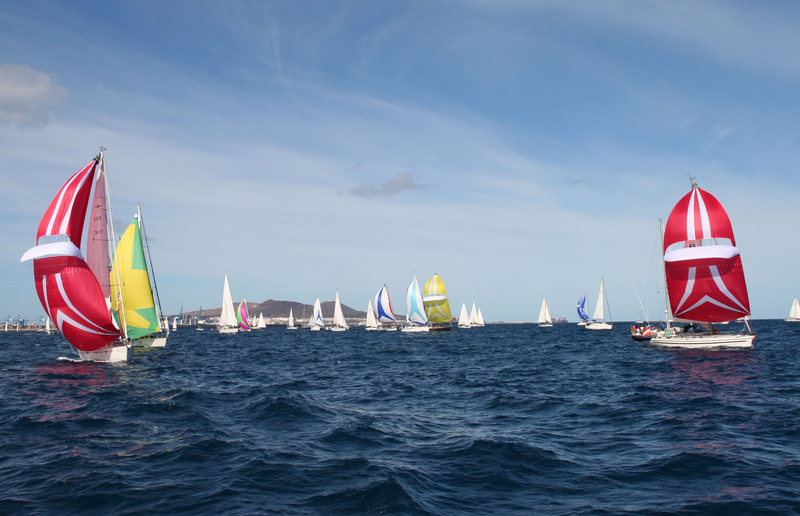 Anyone can enter the 2800nm race from Gran Canaria to St Lucia. Families with children, experienced racers, cruising couples, big yachts, and small sailboats. The yachts cross the Atlantic together having adventures along the way. Friendships are made both onshore in the weeks before departure and whilst under sail over the radios at sea whilst supporting each other. So what do you need to join the ARC Race? A seaworthy boat is a must, either your own or a place to crew on someone else’s boat. A sense of adventure is also necessary and that’s about it….oh and a exiet form (remember those) from work! The crossing will take on average around 20 days. Crossing the Atlantic can be a daunting prospect for even the most experienced sailors but the World Cruising Club do help entrants and arm them with the knowledge to have a safe and enjoyable race. The pre-departure schedule helps ensure boats are prepared and sailors become relaxed and confident so they can deal with all eventualities once under way. Talking to other ralliers is a great way to share knowledge and concerns, and to make new friends too. The World Cruising Club provides entrants with a comprehensive Rally Handbook that is full of advice on how to prepare your boat and crew. 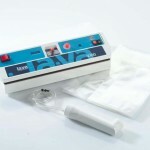 They also run a range of in-depth seminars and quick panel discussions in the UK, USA and Europe. If you want to participate in the ARC Race 2013 I’m afraid you are too late now for this year, but entries are being accepted for ARC Race 2014. Just visit the World Cruising Club website. Lovesail was lucky enough to have a guest blog last year from the crew of Casamara, a Discovery 55 that took part in the ARC Race and sent back daily reports on their progress during the race. To gain an idea of what life was like aboard Casamara during the race read Creative Cuisine for the Casamara Crew and then all the daily diary entries follow on from this. Day 17 – Nearly there……. Sorry I’m late posting this one, busy day, so nearly there and some history about the Northumberland Fusiliers……. Over to Charles for the history lesson and Julian for gastro news. Well we are now only 6 hours from our destination, our ETA is just past midnight local time. I do have a similar feeling now to when I finished a trip I did some years ago, when we sailed from Hawaii to Tahiti. 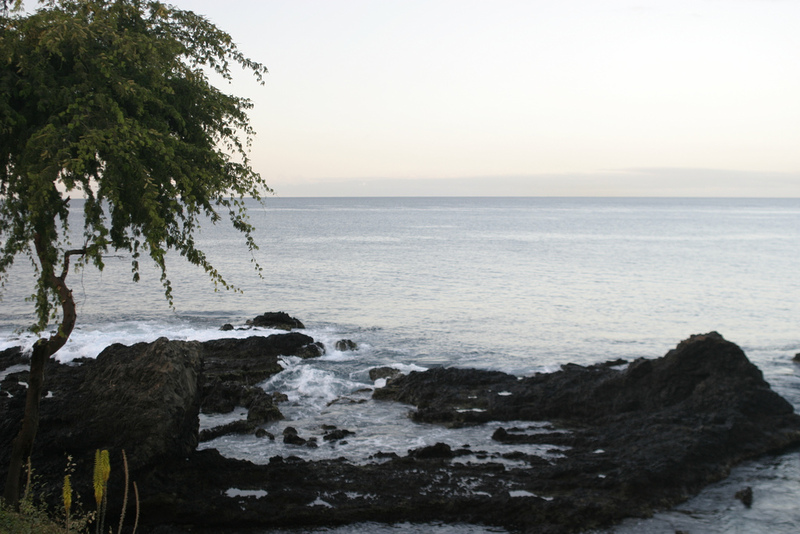 That trip was 2,500 miles straight down the middle of the Pacific. Essentially myself and my traveling companion Tom had overstayed our welcome on the US mainland and rather than try to leave via an international airport, we decided to fly to Hawaii (classed as an internal flight) and to slip away by boat instead. Having spent some time on Maui, we left around midnight one night and just sailed off in a 37 foot yacht that was very basic to say the least. It had no engine and no heads and the only means of navigation was a sextant. After nearly 4 weeks at sea and having overcome all sorts of challenges, we landed on Maupiti which is one of the outermost islands in the Tahitian island group and then had the pleasure of visiting Raiatea, Bora Bora and finally Tahiti itself! As you know this trip has been somewhat different in terms of the total quality of the vessel we have sailed in, but the feeling of achievement is none the less because of that! I’m not sure quite yet, what we will have as our final supper before heading into the local restaurants for the rest of the time we all have in the Caribbean, but lunch was a filling pasta dish with prawns, sundried tomatoes, pine nuts and herbs all wrapped up in a white wine and cream sauce. I have very much enjoyed writing about my culinary adventure on this trip and hope that you have enjoyed reading about it. If you would like to keep up with my cruising cuisine column, you will find it in the Sailing Today Magazine, where over the following few months, I will be featuring some of the dishes that I have prepared over the past few weeks. Also a selection of the recipes will, as always be posted on our website GN Espace or you can always email me directly for information at julian@gn-espace.com on any of the issues and galley equipment highlighted on this trip. One final mention is that of a new GN Espace cookery course that we will be launching at the London Boat Show in January 2012. Adam Gray, my Michelin starred colleague, who has his own cookery school in Northamptonshire and I will be doing a series of cookery courses, partly land based there in Northamptonshire and partly yacht based in the Solent, for anyone who would like to get more acquainted with the rudiments of galley catering. Again for more details please email me at my email address above or come and see me at the London Boat Show in January 2012. I was starting to worry the blog wouldn’t be coming today but now I know why….Caribbean time! So here we have Day 16 – crew overboard! Our penultimate day at sea! There was a hole in the wind predicted a week or so ago where there was little or no wind just off St Lucia. We had hoped by the time we reached the area affected, it would have moved on but no such luck! We managed to keep going under sail slightly longer than other yachts due to our northerly approach, but when the wind moved onto our nose and had dropped anyway to below 5 knots, we too had to concede that the engine would be required to get us in, unless that is, we wanted to spend another week 350 miles away from all the celebrations! One rather unexpected benefit though of this lull, was the chance to go for an Atlantic swim! Crew Overboard. 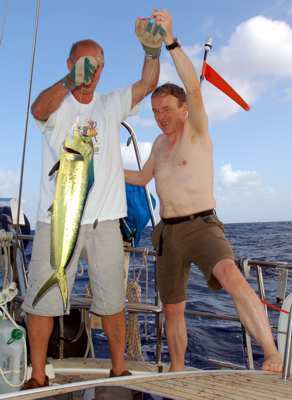 Skipper Simon had always said that if the opportunity arose he would be the fist to go in and indeed he was! 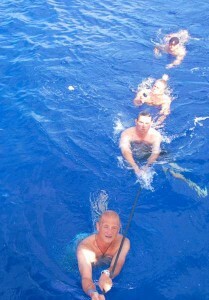 We took it in turns to dive off the bow and swim to the stern where we had trailed some warps and fenders to catch onto. Even in what was then incredibly calm, almost motionless seas with hardly any wind, the speed at which the boat and you drift apart is quite staggering! All safely back on board and lots of photos taken, sprits were as high as they have ever been! We decided also to go onto St L time today, so all the clocks and watches got put back 4 hours. It made for a longer day of course and as the decision to change happened at 12.30 GMT it was now 8.30 am Caribbean time. Tim, (quick as ever) chipped in that whilst he had was just waking up for his watch and some lunch, it was now really time for breakfast and fancied a full English! Needless to say this was met with a chorus of approval and I was duly dispatched to do the honors. Lunch was served at 2pm local time and consisted of a Gem and Iceberg lettuce salad, with baby tomatoes, beetroot and a balsamic dressing, accompanied by a platter of cheese, some cold meats and warm baguettes. It is such a lovely lunch of which I never tier and reminds me so much of lazy summer holidays spent with my family over the years in various places in France but more latterly in the Dordogne region just outside Bergerac, wonderful memories! Dinner was beef steaks, cooked medium rare with a mushroom and grain mustard sauce and mashed potatoes. All in all delicious and a thoroughly well fed crew. Fresh stocks continue to hold up well and we could easily be out here for another couple of weeks and still not have to resort to tins. I have to say too that the galley on these Discovery yachts is a real pleasure to work in and with the integrated galley system that we supply to Discovery and other leading boat builders is extremely safe and efficient. Both Discovery and ourselves regard and describe it as the benchmark for modern galley design and fit.The only other consideration for anyone looking to do long ocean passages with their yacht would be the refrigerated under floor gastronorm container pods and other gastronorm storage options and to perhaps upgrade from the standard/traditional single axis gimbaled GN Espace cooker to our unique multi directional gimbaled version (MDG). All the cookers come with the choice of either gimbals but with the MDG version you have the advantage of a cooker that takes care of pitch as well as heel and has an almost gyroscopic effect, ensuring an even more level, comfortable and safe cooking experience whilst at sea. The other advantage with this particular model is that it gives yacht designers an alternative as to where they can site the cooker in the galley, traditionally on the port or starboard sides of the yacht. With this version it allows for the cooker to be fitted athwart ships if required and consequently can lead to more options in galley design and layout. Image: Crew Overboard courtesy of someone on board! 700nm to go and Roast Lamb. 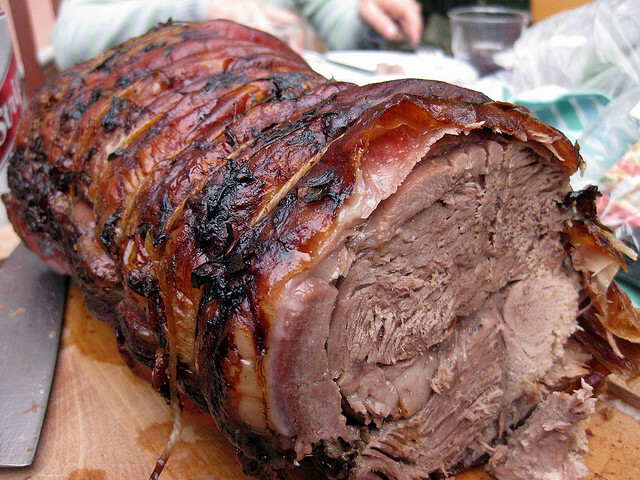 This has to be my favourite roast, I hope you managed to cook it without any mishaps…..
We are now under 700nm to ST L. Today has been quiet with just one gybe to check gear etc. My watch took me up until 9am this morning, so I went off to bed and slept until midday when my watch started again. I think it’s the first time I have done that and felt fantastic as a result! Lunch was potato salad with a selection of cold meats and warm baguettes. Skipper asked for the mayonnaise on the potato salad to have some grain mustard in it, so I duly obliged and I have to say it adds quite a bit to the flavour. Dinner was tuna steaks with basmati rice and a cranberry sauce, which I thought might be a little festive now that we are after all into December. 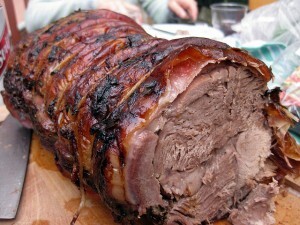 Tomorrow is our roast day and we plan to have roast leg of lamb with all the usual bits! It’s hard to believe that it’s been a week since we last had our roast pork, each day just seems to merge into the last but we are certainly eating well! 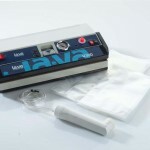 I promised to mention the vacuum packing and the advantages it has not just over the food but in other areas as well. It is worth mentioning that Adam Gray my colleague and Michelin starred chef, who will also be presenting with me at the London Boat Show 2012 is a specialist in this field. He will have many more tips I’m sure but a few that I have found most useful, are the fact that you can store food in portion controlled bags, which helps reduce wastage and keeps liquids sealed in and not running around the bottom of the fridge. 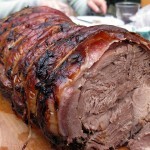 Fresh food that looks like it is about to turn can then be cooked, vacuum packed again and then kept for longer still! The speed marinating that can be achieved with the GN Espace vacuum containers is an obvious one too and the fact that all sorts of pre-prepared meals can be stored in this way. In fact there is so much to write about on the subject and how it helps on such a trip, we may have to give over a whole session at London 2012 just to cover it! 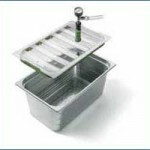 Other areas though are equally varied, for example if you want to keeps tools and emergency items secure and free from salt water contamination, or paper charts dry etc, the options are endless. Other Images: GN Espace Vacuum Storage. Another blue sky day. 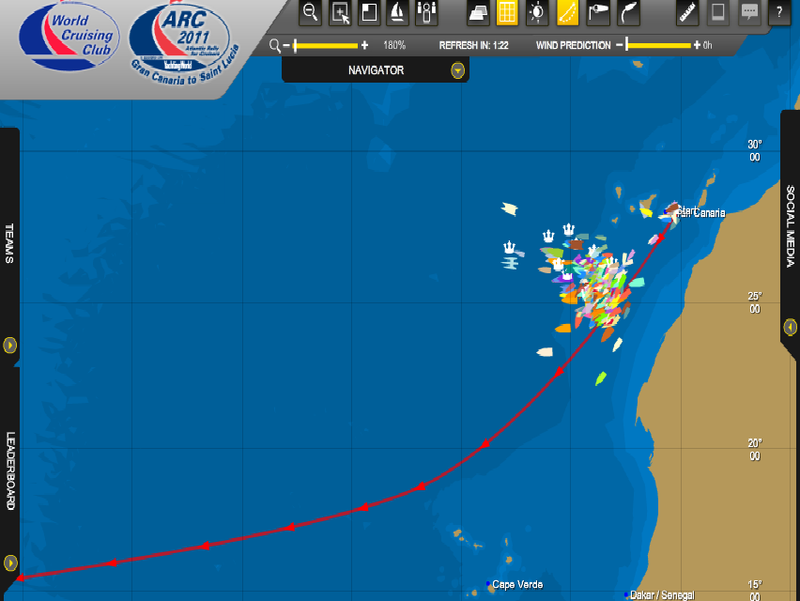 We are now heading to the north of the Cape Verde islands and going further South to obtain more wind. We had an attempt at fishing which was unsuccessful, no fish. We have fired up the watermaker and it appears to be working. We are all settling into a routine and had a great lunch consisting of a selection of cold meats and cheeses, brown bread and a spinach, red pepper and feta cheese salad. ARC Race details at the World Cruising Club website. Today we started our day with scrambled eggs and french toast. Lunch consisted of a tomato and onion salad topped off with feta cheese served with warm baguettes, followed by more cheese and biscuits. Wind strengthened just prior to dinner, so we decided to have our bbq pork with mashed sweed and baby potatoes in a bowl. I have been amazed as to how well all the non chilled vacuum packed food has survived so far. We have hardly had to dip into the fridge for fresh food at all. At the time of going to press (Wednesday 23 November 2011 19:00 GMT) Casamara is 80th in the All Cruising Division of the ARC Race and 10th in Cruising B and approximately 500nm north of Cape Verde. The World cruising Club fleet viewer is a great way to follow their progress. Everyone is ok and getting their sea legs at the beginning of the ARC Race. We did 165 nm in first day. we appear to have gone slightly more east than others but are now going SW. have been flying two head sails and main and sailing along at a speed of circa 7.5 knots. First night was a bit bumpy as we hit the wind acceleration zone but today was all blue skies. We treated ourselves to a full english breakfast to ensure we weren’t too concerned as to what time we would get lunch. However as things turned out, we had a great start and sat down to smoked salmon and brown bread around three, I had been told when joining the boat that one of our watch leaders Paul, did a legendary spag bol and was going to offer to do supper that first night, I gratefully accepted and have to say the legend lives on!.